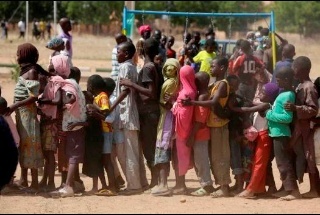 80 children who were freed from Boko haram camp in Northern Cameroon by Cameroonian soldiers in November 2014 cannot remember their names or where they are from and are yet to be united with their families and loved ones. According to Christopher Fomunyoh, a director for the US-based National Democratic Institute, the children range from 5-18 years of age and do not speak English, French or any local language. Mr Fomunyoh in an interview with BBC’s Randy Joe Sa’ah in Yaounde, Cameroon said the children had spent so long with their captors and have been indoctrinated into jihadist ideology that they had lost track of who they were. “They’ve lost touch with their parents. They’ve lost touch with people in their villages, they’re not able to articulate, to help trace their relationships, they can’t even tell you what their names are.”he said He said they are now in an orphanage where they are being rehabilitated.